At Suil Eile Optometrists we have a special interest in providing eyecare for children of all ages. We only fit proper paediatric designed frames ensuring that your child’s eyes have the opportunity to develop to their full potential. We have an extensive child patient base and have the necessary skills to ensure that your child’s experience is comfortable yet thorough. Young Children aren’t aware that they have a problem as their vision doesn’t suddenly go blurred, they do not realise that there is something wrong so they do not complain. This is why we suggest that just like introducing your child to the dentist for regular checkups, you introduce them to us their optometrist at an early age. Our practice offers appointments with our visiting Orthoptist when required. In general children should have their first eye exam at approximately age 3. If however there is a family history of lazy eye or 'Strabismus' ( an eye that turns in or out) then an examination should be carried out at an earlier age. If all is well at age 3 a futher eye examnation at age 5 is appropriate unless otherwise advised. All children will have their eyes checked by a paediatrician at birth and the public health nurse will look for evidence of normal visual development at your child’s developmental checks. 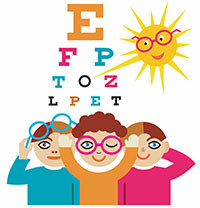 Children have a vision screening in school in junior infants and usually again in sixth class. It is important note that this is just a screening and is not a substitute for a full eye examination with a qualified Optometrist. How can we test young childrens eyes if they cannot read letters? At Súil Eile Optometrists we have a complete range of Paediatric tests including tests that can determine the level of vision in babies as young as 12 months. For older children we use picture based charts until the child is capable of letter naming. Refraction is the process of determining the eyes' need for prescription glasses, in children it is done with the pupils dilated. Drops are used to dilate the pupils and this is normally done at the first visit. It also helps gain a clearer view of the structures inside the eye as part of the health check. The first appointment can last approximately 1-1.5 hours. Pupil dilation is not necessary at every visit but may be done periodically depending on the childs problem. We carry one of the largest frame collections for children in the Ireland. These include frames which are hypoallergenic, flexible, soft, strong and durable, ensuring a comfortable fit for babies and children. Protecting your child’s eyes from harmful UV rays is of paramount importance especially when they are young. Separate sunglasses are the ideal way to provide your child with comfort and protection on sunny days or while on holiday. We carry a variety of Junior sun ranges - Bollé, Nova, Opal and more. These are available both with and with out prescription. If your child participates in contact sports you may want to consider a pair of safety sports spectacles for protection. We stock the Bollé range of sports eyewear. We stock a range of junior swimming goggles both with and without prescription. • Do they keep their grades up? • Do they do their homework? • Do they help out around the house? If you answered "yes", then your son or daughter is probably ready. But, if your child frequently forgets to brush his or her teeth, or if personal hygiene isn't a priority, then they should stick with glasses, at least for now. We are happy to help you determine if contact lenses are right for your child.